You really have to admire the Marvel Cinematic Universe. They have managed to take Comic Book Superheroes, and make them one of the most viable franchises in modern cinema. They have been so successful in fact, that they have enough productions to sub-divide into phases. As of now, we are coming to the end of phase 3, which will culminate with “Avengers: Endgame”. Shifting from big league hitters such as Captain America, Iron Man, Thor and Hulk to characters that have not received as much attention such as Dr. Strange, Black Panther, Guardians of the Galaxy, and the lynch pin, Captain Marvel. Spider Man, quite possibly their most popular character ever, has also recently re-acquired from Sony, so he will also figure prominently in the new phase. When we left what was left of the team after “Infinity Wars”, we learned that Nick Fury had sent an emergency signal to Captain Marvel, just before being vaporized by Thanos. But who is Captain Marvel? Why was she not included in “The Avengers Initiative”? How can she help, when some of earths ‘Mightiest Heroes’ have already been vaporized? These are just some of the questions that this film sets out to answer. While giving the ‘basic gist’ of the story, I’m not going into too much detail; I want to present this review with NO SPOILERS! So buckle up true believers, here we go! Right off the bat, THIS is an ‘origin’ film! Simply stated, don’t expect too much of a plot. Take this film as a “hi, nice to meet you”/first date kind of experience. We start out in the middle of the story, where we learn that a race of people called ‘Kree’ is in a war with another race called the ‘Skrulls’. We learned a little about them in “Infinity War”, but we get more of an insight in this film. The Skrulls are shape shifters, and can control their appearance. This is where we first meet “Vers” played by Brie Larson, who comes off fairly well. She presents a “girl-next-door” type of personality, while also being perfectly believable as a woman that can handle herself in any situation. At times she comes off a bit ‘wooden’, but hey, it’s a superhero movie, not “Titanic”. Vers is dealing with reoccurring nightmares about people she feels she knows, but can’t explain why. She also has a mysterious power that even the Kree don’t understand, but properly harnessed could make her one of the most powerful beings in the Universe. Her mentor, Yon-Rogg (Jude Law) is doing his best to help her figure out both who she is, and how to control her powers. Training her to control her emotions, as that is how she can ultimately control her powers. Jude Law is certainly capable, and believable in what he is being asked to do. That said, it’s not much! His character is certainly not explored to the degree it could have been. The chemistry between Law and Larson is not quite Luke Skywalker/Obi-Wan Kenobi caliber, but acceptable. Much like an older brother helping his younger sister. After learning that the Skrull commander, Talos (Ben Mendelsohn) has captured Soh-Lar a Kree spy. Vers joins Yon-Rogg and a Kree rescue team to retrieve Soh-Lar. Of course, things go terribly wrong and Vers winds up separated from her team, and on a collision course towards Earth. For me, Ben Mendelsohn comes close to stealing this film! He gets some of the best lines in the movie, and delivers them brilliantly. This character, sadly, is not explored much either, but Mendelsohn managers to capture a menacing presence, without coming off as a typical ‘casting couch’ villain. He also demonstrates some brilliant comic timing. Marvel uses a great ploy of ‘going back’ to move forward! Back, meaning to earth in the mid-90’s, (those familiar with the time period will enjoy the many ‘inside jokes’ that are presented.) and there are some genuinely funny moments. This is where we meet a young Nick Fury (Samuel A. Jackson), sans eye-patch, and a ‘rookie’ Shield agent Coulson (Clark Gregg). I’ve never really been a fan of the ‘de-aging’ CGI effects to make older actors look younger, I’ve never thought it looked real, but I will say it was done fairly well, and doesn’t really distract too much. Talos has followed Vers to earth, and is now after her. Sadly, this is where the ‘1990’s’ shtick becomes burdensome, and takes this film into a TV superhero feel. Not ‘camp’ but more like the Bill Bixby/Lou Ferrigno ‘Incredible Hulk’ series. We learn Vers real name is Carol Danvers. She has a mysterious relationship with a Scientist (Annette Bening) she barely remembers. To me it seems that Bening was used for her ‘star power’ and very little else. What should have been a pivotal character was, again, never explored enough to the point that we actually cared anything about her. We also meet her best friend, Maria Rambeau (Lashanna Lynch). Maria Rambeau is extremely likeable, and presents her character as the kind of friend we would all like to have. However, other than being Danvers best friend, there is not much for her to do. Danvers and Rambeau, we learn, are kind of like a female version of “Top Gun”. Yes, there is even a mascot named ‘Goose’! It’s almost as if the writers got a bit lazy during this ‘middle section’ and just went into an auto pilot mode, burping up cliché’ after cliché’ and really over using what could have been a fun little plot point. Don’t get me wrong, there are definitely some laughs, but all in all, the movie drags a bit here. The last 30 minutes or so ramps up, and we get more of the action sequences we were expecting from the trailers. This is where I have to be careful because, as I said before, I don’t want to give away any spoilers. Suffice it to say, we DO learn how Captain Marvel will fit into the MCU in “Endgame”, as well as some interesting little twists along the way. So, in going ‘back’ to move forward, “Captain Marvel” has set the stage for phase 4 of Marvel’s cinematic franchise. While certainly not Marvel’s best ‘solo’ hero movie, it’s certainly not the worst, (that dubious honor belongs to “Iron Man 2” in my opinion) and it’s certainly enjoyable as sort of a ‘Saturday afternoon matinee’! Story line, what little there is of it, is a bit contrived and confusing at times. As for character development, there were so many, so none of them was really explored in-depth. It was certainly nice to learn more about Fury, and how everything ties in together. There were a few moments in this film when I felt that it was heading into a ‘preachy’, feminist, “#metoo” direction, but thankfully it pulled itself back. It’s going to be tricky, moving forward with this character, to not fall into that trap. I hope Marvel can do it, because Captain Marvel could be a very interesting character. I would still recommend seeing it to fill in the last gaps before “Endgame”. This movie does at least explain why Danvers has been absent, and that was satisfying. So, in short: Dull story, some funny dialogue, mediocre villains, and a predictable plot. CGI was well done. As seen on major Disney Fan sites such as Disney World Enthusiast, WDW Hints, WDW Magazine, City Surfing Orlando, Disneyways.com and many more! Rave reviews from all major Disney influencers and talk show hosts are online now – for Peter Alden’s Kingdom Classics CD. Get ready for Classic Disney songs, with a retro rock vibe!! Peter Alden captures the ‘classic’ feel of the golden age of rock and fuses it into some of your favorite Disney classics!! Momosa Publishing LLC (Momosa Publishing), one of the United States’ leading publishers of health, parenting, inspiration, and children’s books, is proud to announce its donation of 25 books to the Literary Luau at Lakeview Elementary on January 26, 2019. Momosa Publishing marketing director Krista Joy has a close connection to this special event. She manages the career of well-known local entertainer Peter Alden, whose adopted son Gabriel Grigsby’s courageous battle with rare genetic brain disorder Adrenoleukodystrophy (ALD) led to the family’s quest to add ALD to the list of newborn screenings in Florida. ALD affects 1 in 18,000 people, primarily boys and some men. It destroys the protective sheath that surrounds the brain’s neurons — the nerve cells that allow us to think and to control our muscles. Championed by State Rep. Mike La Rosa (R-St. Cloud) for years, the ALD screening requirement became state law in May 2018 in honor and memory of Gabriel, who was 10 when he passed away in July 2013. It is a fitting legacy for the brave boy who fought against such tragic circumstances. Gabriel attended Lakeview Elementary and the organizer, Stephanie Walcott was his favorite teacher. Gabriel’s father, Peter Alden, will perform a 15 minute set of songs from the film “Blue Hawaii” at the Literacy Luau. Peter Alden is a veteran of the Legends in Concert Stage and a full-time entertainer. To kick off Literacy Week, Lakeview Elementary will have the Literacy Luau on January 26, 2019 from 11:00 am to 1:00 pm. This event will have many Hawaiian themed literacy activities, a book fair, and an opportunity to meet an author. The school will have community members including; Orlando City Soccer and Wonderworks passing out books to students. Families have an opportunity to read together in our butterfly garden and watch the special guest performances on stage. It will be a day filled with reading, learning, and fun! Momosa Publishing’s mission of helping people raise healthier, happier families is rooted in its commitment to children. Along with its trademark Mommy MD Guides series of advice on children’s health from the country’s leading doctor moms, the firm has published a number of other child-centered books. 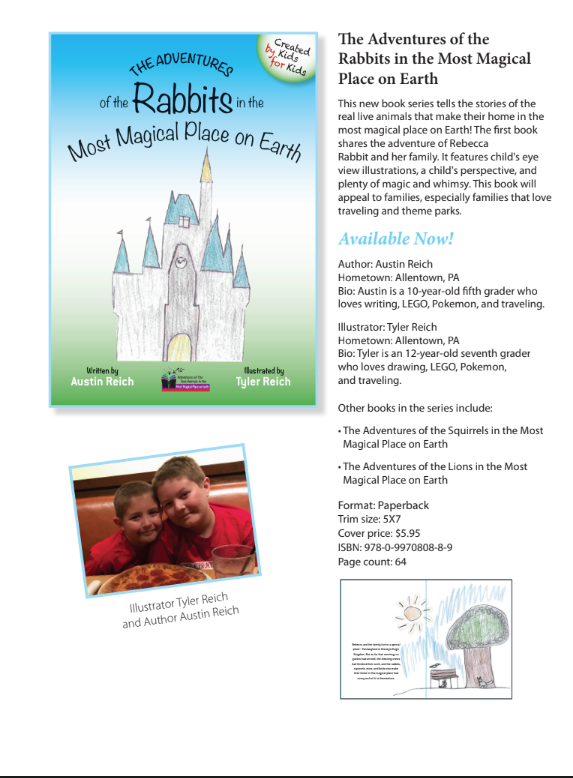 Reich’s two sons, Tyler, 13, and Austin, 11, collaborated on a series of enchanting stories of animals exploring the Magic Kingdom. 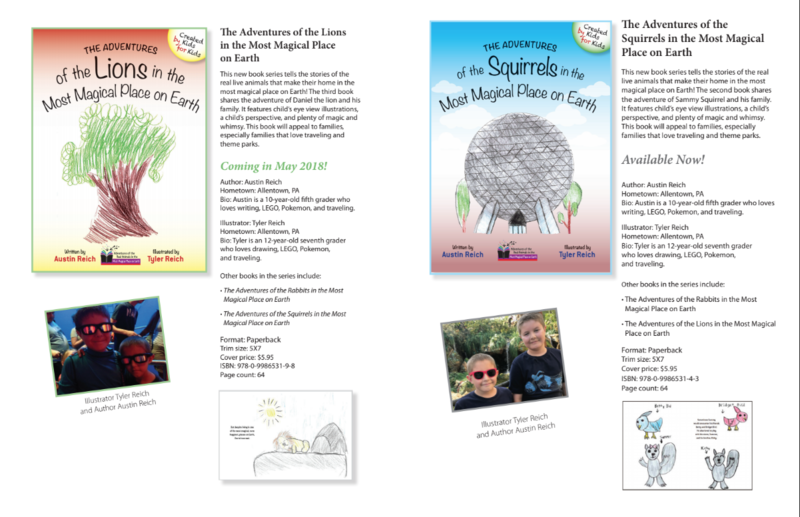 Launched in August 2017, the “Adventures of the Real Animals in the Most Magical Place on Earth” children’s book series tells the stories of the real live animals that make their home in the most magical place on Earth. At the event, Joy will read a portion of the first book in the series, “The Adventures of the Rabbits in the Most Magical Place on Earth” and present Momosa Publishing’s donation of 25 books. The series, which also includes “The Adventures of the Squirrels in the Most Magical Place on Earth” – the story of Sammy Squirrel and his family AND “The Adventures of the Lions in the Most Magical Place on Earth”, the story of Daniel the lion and his family – is available on Amazon and everywhere books are sold. Save Money! Pre-Order”Peter Pan’s Flight” (Written and Narrated by Krista Joy from Disneyways.com) This DVD is now available for pre-order from Theme Parkology! Come one everybody, here we goooo!! This whimsical documentary explores the history of the attraction and was written and narrated by the talented Krista Joy, intro music by James Presley, and animated title sequence by C. Andrew Nelson. This will be a wonderful addition to your Theme Parkology collection. Pre-order until November 5th 2018 and SAVE!! DVD is only $15 when you make this advanced purchase at THIS LINK. So, don’t delay order your copy today! While you are at it, why not add the Enchanted Secrets of Disneyland to your cart as well?